The kitchen is so-called ‘hub of the home’ is where we naturally gravitate at both the beginning and end of the day. For this reason, a lot of our stuff gravitates there too – books, car keys, unpaid bills, scarves, handbags – the usual life trappings. So, keeping this room in order with one of our many kitchen storage ideas will not only save time and stress, it’ll be easier to keep clean. And there are more than enough ways to tackle kitchen clutter, whatever your budget. From kitchen islands to bespoke shelves, utensil containers, under stair storage cupboards, storage solutions for small kitchens, pegboard splash backs and luxurious larders, here are some smart solutions to meet all your kitchen storage requirements. And to make sure your storage work with the rest of your kitchen design, find out how to plan, design and furnish a kitchen. Why build in? Doing so won't just create a more streamlined, hygienic kitchen, it'll help you make the most of every inch of space, too – which means it's the perfect option for if you are designing a small kitchen in particular. Concealed kitchens are a big interior trend for 2019. With living spaces getting smaller and storage getting smarter, clean, minimalist kitchens are getting increasingly popular. Items that once cluttered worktops – kettles, plug sockets, knife blocks, even taps and sinks – can now disappear into flush cabinets and uninterrupted surfaces to make the most of all space available. Nifty no? Perfect for open plan kitchen diners or for small kitchen design, they are great for creating a streamlined look in a contemporary kitchen, too. Pantry storage, can be a thing of beauty that helps you organise your space to make it feel bigger and neater. If you have got the space, factor in a separate room in your kitchen design for a larder and you can check out out pantry and larder storage ideas to keep it all super organised. No room for a dedicated walk-in pantry? No problem, there are loads of freestanding pantries that you can incorporate into your kitchen design. We all tend to keep our cleaning products (see our must-have list) under the sink, and maybe have a rack of condiments and oils right next to the oven, but have you zoned your storage to match your workspaces? Where practical, it can be a great idea to try and give each area of worktop a dedicated role. Maybe you have a favourite place for food prep near the sink, but you like to bake with a view into the garden? Either way, keep the utensils and ingredients you need in cupboards close-to-hand. If you are entertain in your kitchen, think about this too. Make sure drawers of spare crockery are close to hand, or glasses are always within easy reach. Not a kitchen storage idea per se, but if you are in the stages of planning a kitchen extension, you will kick yourself for not including a dedicated space for doing the laundry. A utility room will not only keep white goods and noisy appliances out of the kitchen, but also provides space to hide away all of your cleaning products. It doesn't need to be huge – enough space for the washing machine and a few shelves will be practical and help declutter your main kitchen. Check our guide to planning and designing a utility room for more tips. When you're designing a kitchen, the configuration of your cabinetry – drawers, cupboards and shelves – should be your number one priority. Once you've got the interiors right, you can really concentrate on its looks. Find kitchen cabinet design ideas in our guide. Forget about having to stoop and rummage through a cupboard for that colander/grater/lasagne dish. Pile everything neatly into drawers, instead. This makes storage both easier and tidier – especially if your drawers range in size, from slim (for cutlery) to medium (for kitchen linens) and large (for pots and pans). We love fitting dividers in our kitchen drawers to neatly wrangle pan lids, plastic containers and cake tins. Again, this is where our good friend pegboard comes in handy as you can line the bottom of the drawer with the board, using dowels to separate items. A cabinet with sliding doors provides the perfect place to throw general kitchen clutter when you have guests coming over. If you have a very small space, you will also find that a sliding door is easier to negotiate than standard cupboard doors when they are flung wide open. If you’re investing in a whole new kitchen, think about those extra features that will help to keep your worktops clear. Narrow storage for chopping boards or baking trays will keep them out of the way of prep areas, without cluttering cupboards. You might also want to use small nooks for bottle racks or even a bin cupboard. This kitchen by Olive & Barr includes clever integrated storage for trays – a savvy alternative to keeping them out on your work surface, collecting dust. Check out how in this Ikea kitchen, their Vadholma units have been used to add specific storage for drinks bottles and cooking books. Useful and looks cool. Even the most luxurious kitchen needs to be functional. Keen cooks will know that a lot of fruit and veg do much better when stored out of the fridge, but how do you store your veggies in a sleek and smart kitchen? Smallbone of Devizes have found a practical and good-looking solution in this kitchen – bespoke crates that slide right into the open cabinet shelves. If this gorgeous kitchen takes your fancy, you are going to want to go and check out our luxury kitchen design ideas too. Kitchen cabinets tend to come in standard sizes (unless you go bespoke) meaning you might have a little extra room at the end of the run of cupboards. If this is the case, a slim bookshelf section will maximise the space and keep your favourite recipes nearby. When it comes to kitchen storage ideas, book storage should never be overlooked. This Roundhouse kitchen does just this, creating a neat shelving unit perfect for showing off those cookery books. Even large and luxurious kitchens can suffer from clutter, and it's small items such as keys, notes, and magazines are usually responsible for the untidiness. Keep your kitchen serene and clutter-free with a clever storage solution, such as this brilliant built-in key and magazine rack by Guild Anderson. It’s all well and good hiding away your unsightly clutter, but a kitchen made up of just solid walls of cabinetry risks becoming a bit bland. Incorporate some glass fronted cabinets too, to break up the rest of the cabinetry and pick out your nicest bits of crockery or glasses to display – it's an easy way to add load of interest and personality to the space. And if you want any more tips on designing a freestanding kitchen, check out our feature. When you are looking for kitchen storage ideas, don't forget that many great storage options are not kitchen specific – some solutions look equally at home in a dining area or living space, making them well suited to open plan spaces. If you're designing a vintage kitchen, or a homely farmhouse-style kitchen, it doesn’t get much better than a characterful kitchen sideboard to accommodate stacks of plates, glassware and table linens. Sideboards were popular in Mid-century interiors too and become fashionable again, so you can find some great second-hand versions in charity shops or at auctions. Check out more vintage furniture ideas with our guide to storage for period homes. The industrial-style kitchen is favoured by many homeowners as it can work well in both old and new homes. What's more, it works best when everything doesn't match, meaning you instantly create an eclectic look that can adapt with your kitchen storage needs. Look for repurposed storage from workshops, greengrocers or even factories, or hunt down crates and rack shelving to keep everything tidy. Something of a chameleon in the kitchen, kitchen trolleys are as suited to life as a butcher's block as they are as a spot for vegetable (or wine) storage. This Black Metal Kitchen Trolley from Not On The High Street is a great example of a piece that packs a punch in terms of functionality – hello, sturdy table top and storage space – while working as a beautiful piece of furniture in its own right. Check out more kitchen of the best kitchen trolleys in our buying guide. Utilising your kitchen walls to add storage is a great idea if you are working with a small space. Even if you have been blessed with a large kitchen, having stuff on the walls (open shelving, spice racks, etc.) adds interest to your kitchen while still adding plenty of extra storage. For minimalist interiors, modular shelving is a nice fit. Customisable and flexible, these storage systems can be dressed up or down to suit any kitchen style. What's more, the shelves can be moved around to adapt with your storage needs. Scandi brand String provide different storage options; the system pictured includes accessible shelves for pots and pans, as well as multiple rails and canisters for stashing utensils. You can also find similar modular shelf systems at Ikea and look out for Elfa shelving. If modular shelving is too open for your kitchen storage needs, you can still put your favourite possessions on show by including open shelves or glass doored cabinets. Including cube open shelving units is a nice way of breaking up walls of cupboards, while providing enough room to offload those cookery books, spare vases and random ornaments. While a window may mean a break in cabinetry, you can still use the space around the window for shelving. A slim shelf above the window is a great storage option for small items. Or, if your kitchen happens to feature a generous windowsill, use that for storage too. Colourful utensil containers, potted herbs and dishwashing accessories can all live here. Suspending a rail above your worktop is a fast, easy and cost effective way of adding storage to your kitchen. This is the perfect way to hang those awkward pots, pans, measuring cups and sieves that often clutter up your cupboards. The slated shelves in this kitchen have butchers hooks hanging from them, doubling up the storage. It frees up the kitchen drawers and makes a feature of practical items. 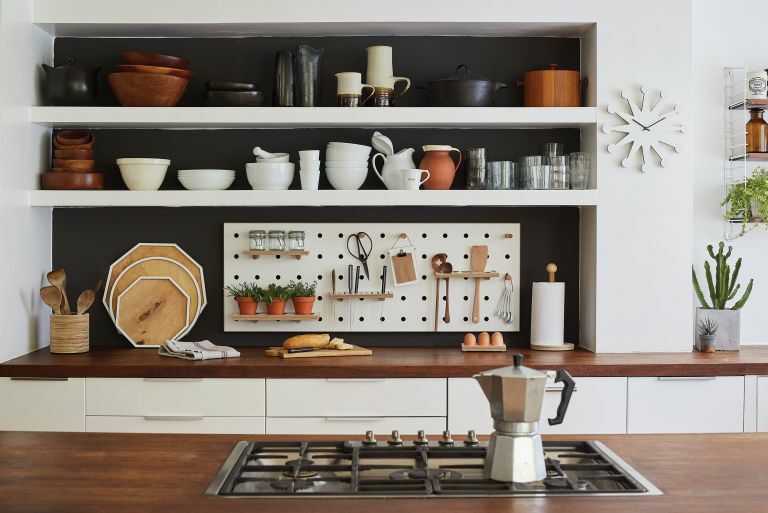 A simple piece of pegboard solves many a kitchen storage problem, saving you valuable time in the morning. Use it to store your keys, baking utensils or those elusive kitchen scissors. What's more, it can be adapted with your changing storage needs as you can not only use it for hooks, but also to create shelves. Pegboard organisers can be bought from a number of retailers, but you can also buy pegboard and dowels from your local DIY store to make your own. Creating a stylish kitchen on a budget? Smaller kitchens need plenty of clever but affordable storage that won't waste valuable floor space. So, look to the walls and see where it might be possible to squeeze in a rail or perhaps a high up rack that you can hang utensils from. Ikea are, as always, full of smart and thrifty kitchen storage ideas and produce a number of stainless steel and powder-coated rails than can be simply fixed to walls. You can then add hooks or even small buckets to hold all manner of items. For example, rather than taking up valuable worktop, why not hang a washing up caddy above the sink? Kitchen storage accessories are important for keeping the small stuff neat. They're a must-have in all kitchens for practical reasons but they need to be good-looking as well as functional if they are to be on display. Here are a few of our favourite ideas – but check out our Mason jar storage and display ideas, too. For open shelving, invest in attractive canisters for utensils, and jars for pulses, grains, teas and ground coffee. Not only will this eradicate unsightly packaging, but helps keep ingredients fresh. Choose glass for the likes of pasta, rice and cereals so you can see when you need to restock. Storage canisters are also another way to add pattern and interest to a neutral kitchen scheme. Check out these nifty storage jar ideas for more inspiration on how you can use the humble glass jar as decorative storage for your kitchen shelves. If the shelves in your kitchen cupboards have large gaps between them, use shelf inserts to create extra levels and practically double the space you have. A clip on basket can also maximise space. These ones are from Ikea and you will find similar storage baskets at John Lewis. Kitchen cupboards can be the place where tins and jars go to die. Bite the bullet and have a sort out of all of all your cans, spreads, tins and condiments. Anything with a label that resembles 'Sarah’s Christmas Chutney 2009', get rid. Store what’s left of your cull in drawer organisers or a tin dispenser so you can always see clearly what you've got to work with. We’ve said it before and we will say it again, don’t forget to put the back of your kitchen door to good use. This space is easy access, so store things like smaller snacks or frequently used spices – you can just grab them and go without have to wrestle with a mountain of tins. Door storage unit from Elfa.